Oatmeal is pretty standard breakfast fare around my house, but it's usually simply cooked on a stove-top and served plain with a little milk, maple syrup and some berries. 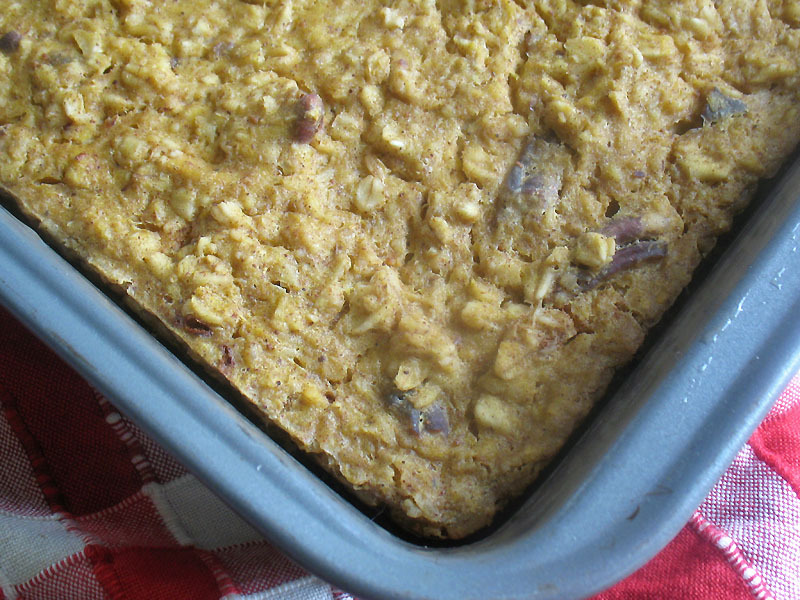 But I do enjoy going the extra step once in a while to make a baked oatmeal pudding, and with plenty of pumpkin purée in the freezer, it was an easy choice to go with a baked pumpkin oatmeal with all the pie spices that fill the kitchen with delicious aromas. 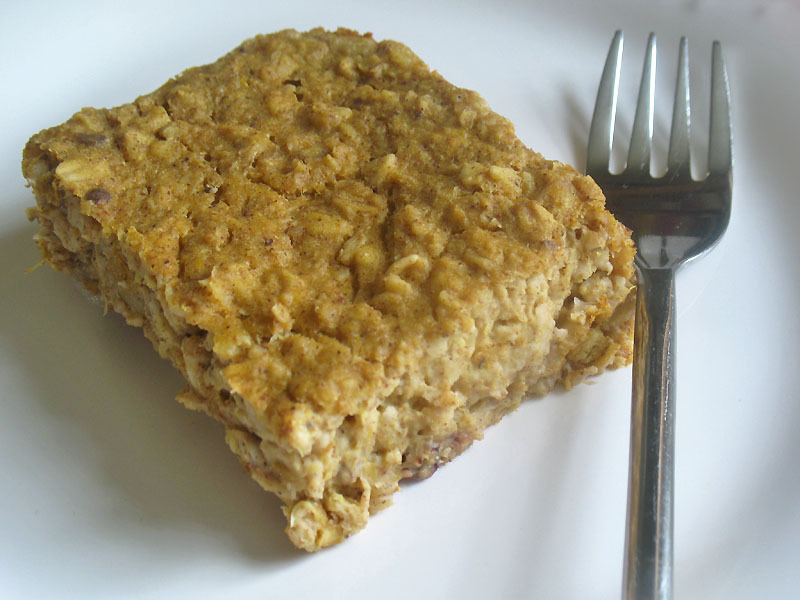 Soft, creamy and chewy, this oatmeal pudding comes out of the oven like a flour-less coffee cake, and is as nourishing as it is simple to put together. Soaking rolled oats in plain good quality whole fat yogurt overnight before baking breaks down the grain's complex proteins into easily digestible components and results in a delightful spongey and almost custardy texture in the finished cake. And, of course, there's pumpkin and some toasted pecans… It's not too sweet, either, sweetened with just a quarter cup of maple syrup, but you can make it a sweeter dessert pudding cake by increasing the maple syrup to a half cup. You can use canned pumpkin easily as long as it is not the already spiced and sweetened pumpkin pie filling. Combine the oats and yogurt in a large glass or ceramic bowl. Cover with a clean dish towel and let stand overnight at room temperature. If using pecans, toast on an ungreased baking sheet at 350° for 5 minutes or until fragrant and slightly darkened. Butter or oil an 8 × 8 inch baking pan and preheat an oven to 350°. Add the pumpkin purée, milk and vanilla to the oat and yogurt mixture and stir to blend. Add the spices, salt and pecans if using and stir until everything is well combined. 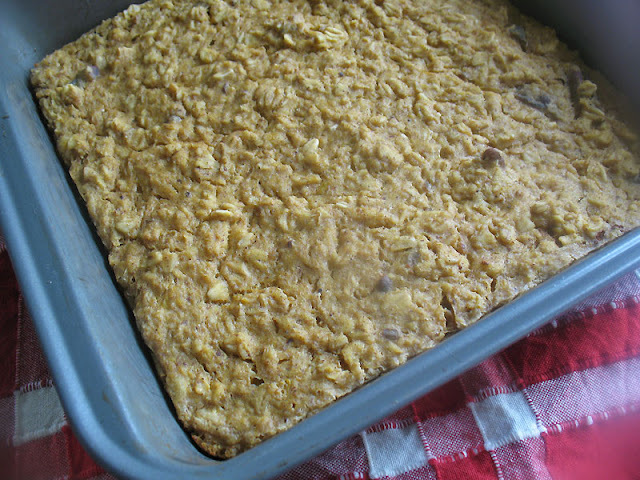 Pour the mixture into the prepared baking pan and bake for 25 to 30 minutes until set and lightly browned on the top. Let cool for 5 minutes then serve warm, garnished with extra toasted pecans or drizzled cream or maple syrup on top if desired. Reheat leftovers in aluminum foil at 300° for 6 to 8 minutes.